Again, my taste and desire for food has been inspired by the season and current weather...Also politics. Comfort food NOW! I have also been thinking about the upcoming Winter Olympics in South Korea. Thinking about all the winter sports, namely skiing of all kinds (I know you all thought I was going to say ice skating. Well, that too.) made me think about the Savoy region of France and of course… a great potato dish for a little Après Ski. Now if you remember back in March 2017 I did this great pureed potato dish called Pommes Aligot. Basically from the same region, using regional cheese, and as hearty and delicious of any potato recipe out there. Well, until I remembered the king of potato indulgence… TARTIFLETTE! Tartiflette is this wonderful scalloped potatoes style dish. 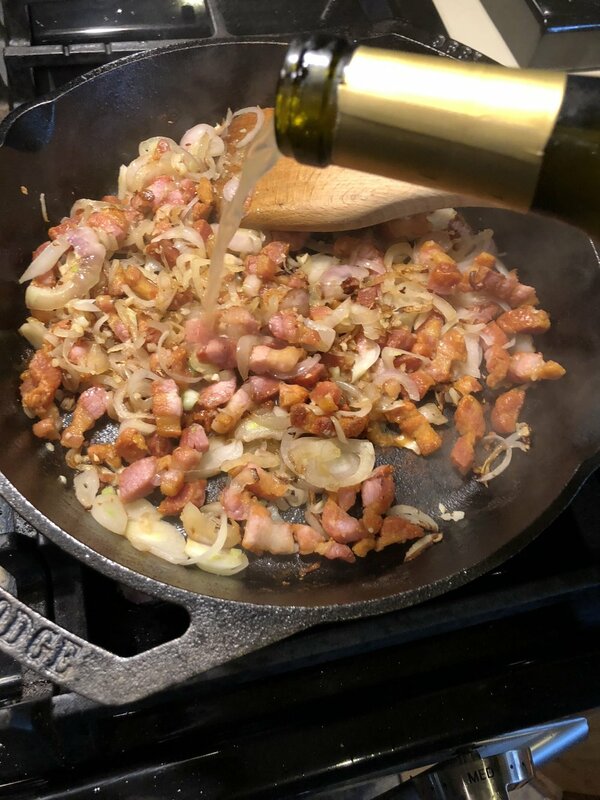 Made with smoked bacon or salt pork, caramelized shallots, rich and dreamy crème fraîche, a little splash of white wine, and the pièce de résistance the addition of Reblochon cheese. The trick to using Reblochon cheese here in the states…. Is that you can’t. Because it is made with raw milk the US will not import it in from France. True reblochon, as with anything “made” in France, cannot be authentic unless it is made in that location and style; think Champagne designations. So what is an easy fix? Any creamy, stinky, washed rind cheese will do… such as a ripe Camembert, Brie, or even a French Raclette. Some say Gruyère but I think those would be too hard and waxy, so I’m sticking to the soft stuff. Porte Salut comes to mind as ripe, easy melting, soft cheese as well…. The idea is to layer all these ingredients, including the cheese, and what you end up with is a magical melange of creamy flavorful layered decadence. As you will notice I have not added any additional salt. The salt coming fo the lardons, crème fraîche, and cheese, are plenty. If you would like a kick of spice to this dish, consider adding cayenne or red chili pepper. Tartiflette is a perfect dish on its own, accompanied with a nice watercress or other peppery green salad, or cut down into smaller dishes as a side with roasted meats. However you want to enjoy tartiflette, do just that…. Enjoy! par cook the potatoes first. Layer with crème fraîche, bacon and onions, and CHEESE! Begin by heating your oven to 375 degrees. Wash and peel the potatoes then slice 1/4” thick. Place into a pan, cover with water and bring to a boil. Turn down the heat to a light simmer and cook approximately 15 minutes or until just fork tender. Drain in a colander and set aside to cool. While the potato slices are cooking, dice and slice you salt pork (or bacon) and onion/shallots. In a hot heavy skillet begin cooking your lardons. Render out the fat well and cook to medium-well crispness. Drain all but around 1 tablespoon of the fat, and add the sliced onions and garlic. Cook along with the lardons until lightly caramelized. Deglaze the mixture by adding in the white wine. Be sure to scrape up all the cooked on bits from the bottom and sides of the pan. Cook until the wine has evaporated and cooked into the mixture. Remove from the pan to a mixing bowl. In the mixing bowl along with the cooked radon-onion mixture, add the 2 cups of crème fraîche. Next, add the fresh thyme and fold everything together evenly. 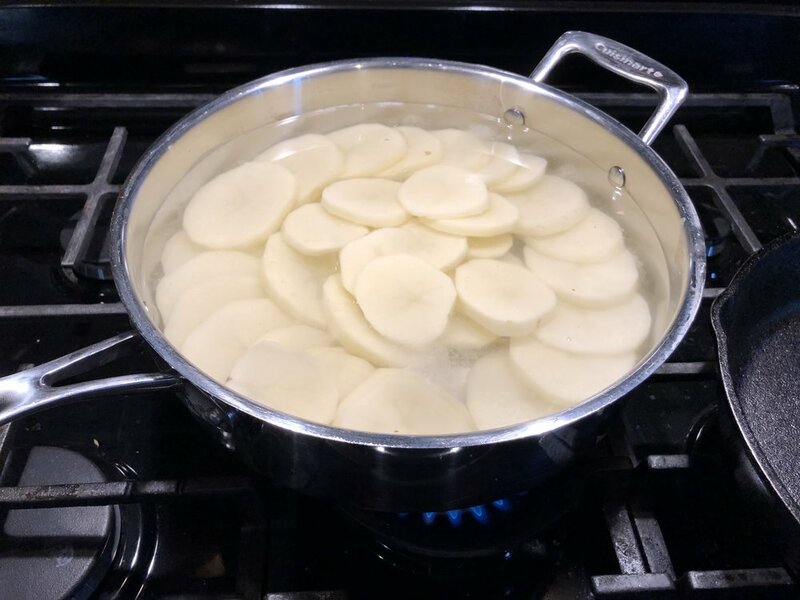 In a large gratin dish or shallow baker, begin shingling/layering in the potato slices. Add a layer of the cream bacon and onion mixture. Slice half of the cheese, with the rind, and layer on top. Add another layer of potatoes, folded in with the cream mixture and finishing off with the last half of the cheese right on top. Pace the entire dish into the oven and bake approximately 50 minutes, or until the potatoes are cooked well and the top had a bubbly caramelized/broiled crust. Remove from the oven and serve hot!